"The Portrait", which opened last night, is a two act, no intermission play featuring an ensemble cast of seven characters. The performers are all quite accomplished and capable, and do their best to bring this new material to life. The cast includes Roger Hendricks Simon, who also directed the play, and whose long list of credits date back to being a founding member of Yale Rep in '67. 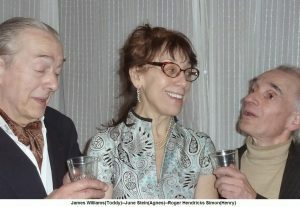 The play takes place in the generously appointed, and domestically staffed, Park Avenue apartment of Toddy and Helen (James Williams and Caitlin O'Heaney), a jet-setting upper middle-aged couple. Their affluence is underscored throughout the play with references to their second home in Rye, and their need to escape all their tedium by jetting off to Hawaii, Paris, and other destinations. This evening, they are having guests over, Toddy's somewhat less successful brother Henry (Simon) and his comically frumpy and annoying wife Aggie (June Stein), who drove in from New Jersey. The essence of the play is established early on. Each brother wishes to have three very valuable family portraits brought together so that they can be displayed as a family gallery. Of course, each brother wants this gallery to reside in their own residence. Each brother owns one portrait, and a third is owned by a much younger nephew Marty, who inherited it from his diseased mother, their sister. The two brothers wager a bet: The one that can obtain the portrait from young Marty and his beautiful wife Alissa (James Leaf and Jessica Eleanor Grant), will win the lot, including the other brother's portrait. So ensues the evening's dinner party, complete with personal slights, hidden motives, ancient grudges, French maids with attitude (Rutanya Alda), and in the end a surprise twist. Along the way we are treated to a short song by Jessica Eleanor Grant, whose voice is as captivating as her glowing blue eyes, and a noteworthy performance by James Leaf who has great energy and spirit in his performance. “The Portrait” is pitched as “a new comedy of BAD manners”, a tagline that naturally brings one's thoughts to old-style drawing room comedies by Oscar Wilde and his ilk. Such a format relies on basic human interaction. And generally speaking, the more basic—or preferably “base”—this interaction, the truer it will ring, and funnier it will be. The success of such a play hangs on clever and scintillating dialogue. But unfortunately, “The Portrait” gives us little of either. The number of real laughs can be counted on one hand, with other attempts at humor falling drearily flat. The direction cannot make up for lines that neither entertain, nor move the story ahead. As mentioned, there is a clever twist at the very end, but the payoff isn't worth the wait. Playing at Theatre 54 through Jan. 26.